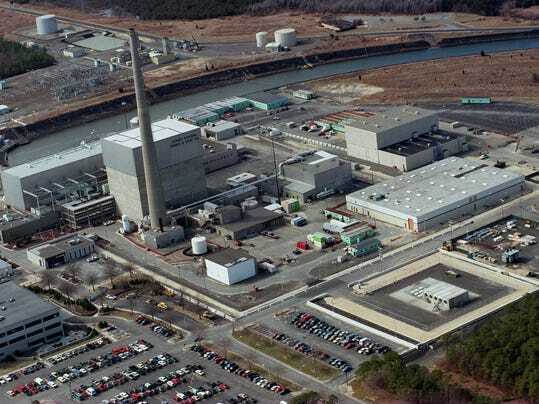 Oyster Creek operators started shutting down the reactor power at about 8 p.m. Monday, and it’s not known how long the plant will remain offline, according to Suzanne D’Ambrosio, a spokeswoman for the plant. She said the reactor must be shut off for workers to access the five installed electromatic relief valves inside the plant’s drywell, the containment vessel around the nuclear reactor. They are part of the plant’s automatic depressurization system, linked to the emergency core cooling system. In the event of a loss of coolant from a small pipe break — when pressure inside the reactor area remains high — the valves are there to quickly lower the pressure so the emergency system can inject water into the reactor core. The potential problem began in late June during a maintenance inspection of the valves, NRC officials said. That raised a red flag with nuclear critics, who questioned why a plant shutdown was not required sooner by the NRC. The valves are operated by solenoids, powerful electromagnets that slam the valves open when energized. NRC spokesman Neil Sheehan said plant workers “found more than expected wear” on valve springs and supporting parts. Gundersen said the valves are routinely tested in place, but also that kind of wearing can come from the machinery vibration that’s part of the environment inside a nuclear plant. In those instances, a shutdown is required, according to the notice. Gundersen said he wonders why the shutdown did not happen sooner. “Were they waiting for parts?” he said. Technically, the indications that valves could have a problem should initiate what’s called a “limiting condition of operation” that needs to be resolved soon under NRC rules, Gundersen said. “That said, the decision to declare it in operable is less defined,” allowing the NRC to cut operators slack, he added. The valve issue shows why reactors such as Oyster Creek need filtered vents to control discharges during emergencies, said Janet Tauro of the local group Grandmothers, Mothers and More for Energy Safety, which have pushed for the NRC to impose that proposed rule.